The Kerala floods have been an eye-opener on many fronts. While the entire nation united to help those affected by the devastating floods, certain section on social media backed by the intellectual elite have been using the tragedy and the misery of people to further their agenda of dividing Indians along regional lines and fan separatist sentiments. Others have used a false claim that the UAE had promised funds to the tune of 700 crores rupees as an aid to Kerala to attack the Central government and further cause resentment in the hearts of Keralites against North Indians. Meanwhile, the Kerala government tried to shift blame for their poor management of dams and accused the Tamil Nadu government of being responsible for the floods while totally ignoring the massive exploitation of the Western Ghats in collusion with the Church that has contributed enormously towards the floods according to experts. One such divisive story that has been doing the rounds is that of a man called Suresh Kochattil who has been accused of claiming that only the rich and middle class have been affected by the floods in an audio clip that has been circulating on WhatsApp. In the audio clip, Kochattil does not claim that only the rich and the middle class have been affected. He says that “5-10%” among those affected are poor. In the audio clip, Kochattil warns people about scammers who are lurking around every corner seeking to make quick bucks from the calamity and asks people to exercise some caution while donating resources for the victims. He mentions a couple of charities that he approved of and expressed reservations about the Chief Minister’s Relief Funds. He stated that it may not be the best avenue for service at the present moment. In the audio clip, Kochattil, who claims he has been working on the ground to provide relief to those affected, asserts that money is not the foremost priority at the present moment. He suggests that carpenters, electricians, doctors and other such professionals are more of a priority. 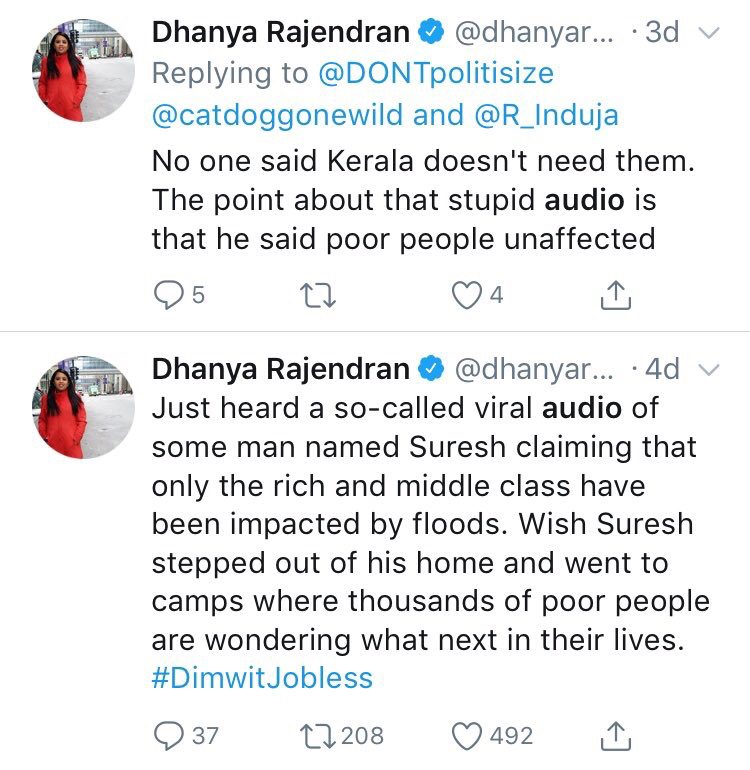 His audio clip revolves around the assertion that materials are being sent to Kerala which is not entirely needed currently and professionals are more of a priority at the moment than money. Suresh Kochattil had also written posts on Facebook documenting his opinions which have attracted a lot of criticism and abuse. 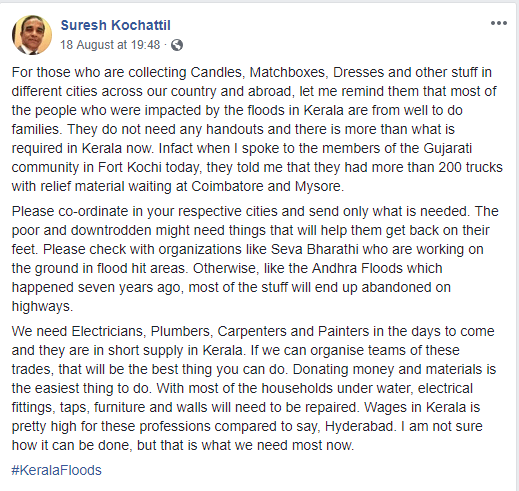 It is also pertinent to mention that Kochattil did not ask anyone to stop contributing towards the relief work underway in Kerala. The following is the Facebook post in contention. The Hindu has reported on the audio clip and dubbed it ‘Fake News’. The News Minute, on the other hand, published an entire analysis of the contents of the audio clip and insinuated that Kochattil had done a lot of harm. They wrote, “Help Kerala. Ignore Kerala. But please don’t cause us more harm than we have already suffered.” Suresh Kochattil is associated with the BJP and the RSS and certain media outlets have used his political affiliations to cast aspersion on his motivations. In the petition, Kochattil has claimed that he has received threats over calls and texts and messages on his phone and social media account. Kochattil also claims to have received an email from the cyber crime wing of the Kerala Police who accused him of causing ‘disharmony amongst different sections of the society’ which is a punishable crime under the IPC. The Kerala Police have also summoned him to report before the Inspector General of Police in Tiruvanantpuram. Kochattil now fears persecution by the state police for his political affiliations. Kochattil claims that the controversy is created solely because of his association with the BJP and the RSS. He has also mentioned several media houses by name in his writ petition. The petition says, “On 19-08-2018, the media houses The Quint, News Minute, NEWS 18 started circulating articles with the fake and ill-motivated news and branding the petitioner as a BJP and RSS worker with anti-establishment leanings. Surprisingly News Minute which had severely condemned the petitioner for his RSS affiliations and the Facebook post made by the petitioner on 18-08-2018, published an article on 19-08-2018, repeating the required assistance as highlighted by the petitioner in his post. Surprisingly, on 20.08.2018 The News Minute also published a news article stating closure of a fake SBI account in the name of Kerela CM Relief Fund”. He says that it was owing to the mass circulation of misrepresentation that he started getting threatening calls and had to switch his phone number off. Kochattil has appealed to the Court to issue directions to the central government and the state governments of Kerala and Telangana to ensure his safety and that of his family and after a fair assessment of the threat, provide security if necessary. He has also appealed to the Court to direct Kerala Police to not pursue any action against him for his posts on social media. Kochattil claims he has been scared for his life and was forced to switch off his phone after receiving innumerable threats via calls and texts.